The new GP37 DGPS/WAAS Navigator is compact in size, yet big on power, features and performance. This waterproof unit is perfect for a wide range of boats. It is equipped with a WAAS and a DGPS receiver as standard supply. It utilizes both WAAS and differential radio beacon correction methods to give you the most accurate position fix available. 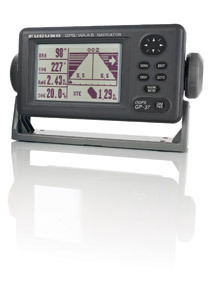 FURUNO GP150 is a GPS navigator designed for the SOLAS ships according to the GPS performance standard IMO Res MSC.112(73) and associated IEC standards. It is a highly reliable standalone EPFS (electronic position fixing system) that feeds positioning information to AIS, Radar, VDR, VideoPlotter, Autopilot, Echo Sounder and Sonar. 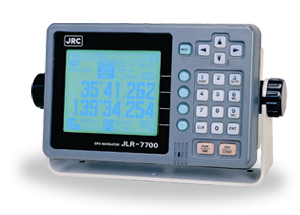 The JLR-7700Mk2 DGPS navigator pinpoints your precise location by means of a simultaneous reception of 12 satellites The DGPS navigator composed of a DGPS receiver and a LCD display unit ensures very accurate position fixing. 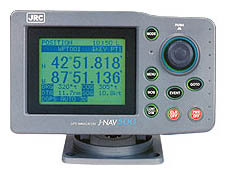 The JNAV-500 Fixed Mount Navigator is a compact and simple to use GPS display. When connected to the GPS 112W sensor, you can display navigation data to 400 Waypoints and 20 Routes. The JNAV-500 has multiple displays including Satellite Status, Route information, Waypoint information, Plotting display up to 100NM and navigation information. With the large waterproof display and Jog Dial, the JNAV-500 is suited to work in any environment.